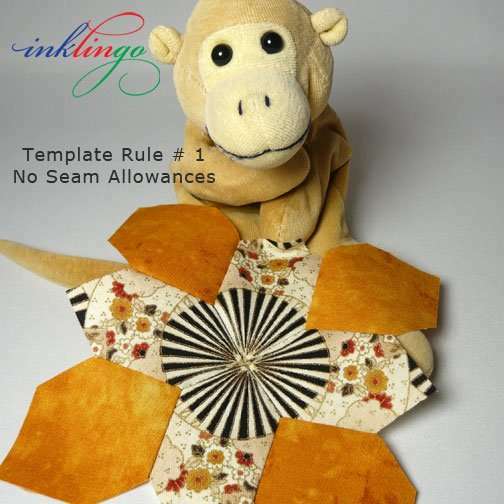 This time, let’s look at the second method of fussy cutting with Inklingo—templates! Use templates without seam allowances. whether or not you will mark a sewing line, crosshairs, matches, etc. My first choice is always to print on fabric with Inklingo but there are situations when templates make sense. This article focuses on fussy cutting but the info is helpful any time you need templates. I do not recommend EPP for any design but the tips below will help you with that too. Use templates without seam allowances! 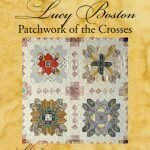 If you have been using metal, acrylic, or plastic templates with seam allowances for Lucy Boston Patchwork of the Crosses (or any design), you will love how much simpler and more accurate it is to work with templates without seam allowances! I love anything that is simpler and faster with precise results! 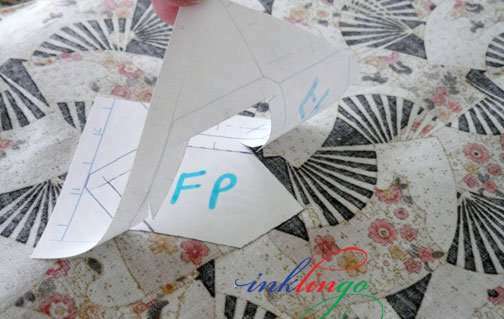 In the POTC book, I recommend freezer paper (FP) templates whenever you are not printing the shapes on fabric with Inklingo. 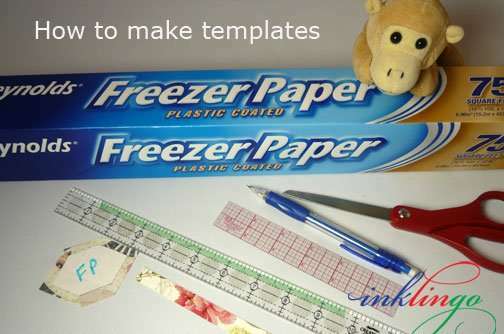 Once you learn how to use freezer paper to make templates, you will never need to buy acrylic/plastic/metal shapes again—whether you use Inklingo or not. If freezer paper (FP) is new to you, there is an article about it (what it is, etc.) under the Top Ten Tutes tab (above). The fabric above has holes all over it! 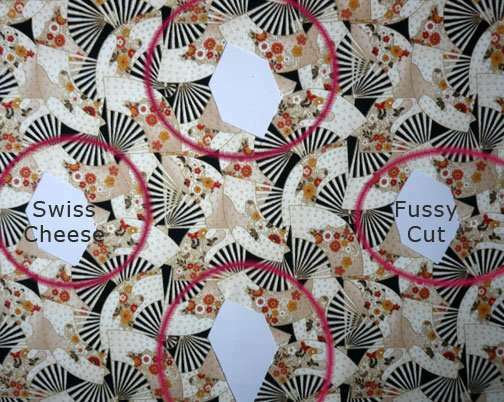 “Swiss cheese fussy cutting” can require a lot more fabric and it takes longer than printing identical sheets of fabric with Inklingo but it works beautifully in the right circumstances. 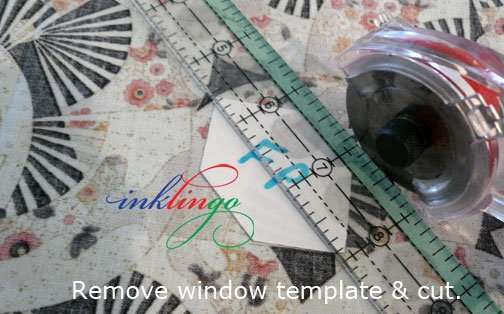 My first choice is Inklingo No Waste Fussy Cutting (see Part 2) but Inklingo is the very best method for traditional Swiss cheese fussy cutting with templates too. 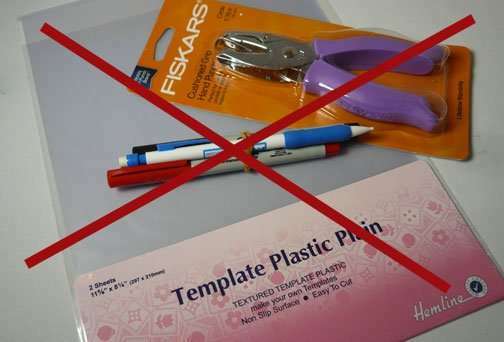 I have never liked using acrylic or plastic templates. They slide . . . but the main problem is that they include the seam allowances. If templates with seam allowances were ever a good idea (doubtful), it stopped being smart when quilters started using freezer paper more than twenty years ago. Freezer paper templates without seam allowances can be matched with any of your acrylic rulers, so you can rotary cut more accurately! People who make templates don’t tell you this, of course. They don’t want you to know our little secret. Buying acrylic shapes makes no sense if you have freezer paper and an acrylic ruler. 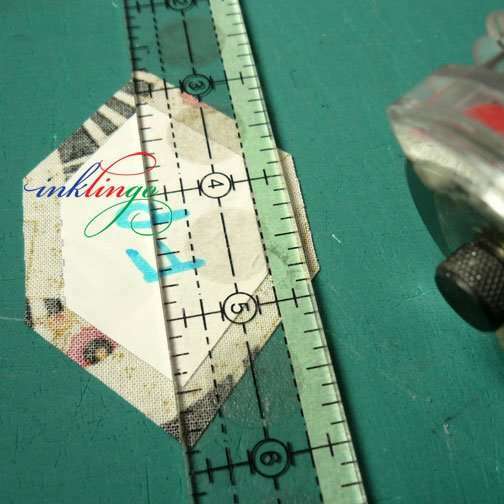 The photo shows how I add seam allowances around a hexagon template when I cut (one seam allowance left to trim), but it is the same for diamonds, hexagons, triangles, kites, Cleopatra’s Fan, Double Wedding Ring—ANY shape for ANY design. FP + an acrylic ruler can be used for ANY shape! Which one would you rather sew? Dot to dot or along a line? This is my main problem with templates with seam allowances—they add extra work and make it more difficult to sew. The sewing line is more important than the cutting line, so it makes no sense to use templates with seam allowances. They are not designed to let you mark sewing lines on the fabric. Even in countries where freezer paper is not available in grocery stores (the way it is in North America), freezer paper costs less than other templates. That’s it! Do you have everything? For Swiss cheese fussy cutting, I use a window template AND a template without seam allowances. FP templates are great when I am fussy cutting because they make it easier to ensure that I am cutting identical shapes but I love them even when I am not fussy cutting. 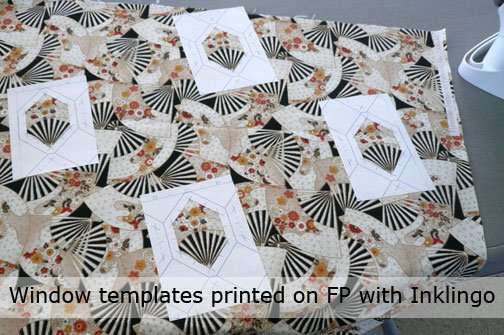 In this example, I printed POTC hexagons on FP with Inklingo. You could just draw or trace the shape from the book to make these two FP shapes. STEP 1 – PRINT WINDOW TEMPLATES! First, I print the Inklingo shapes WITH seam allowances on FP and cut it into separate windows, as many as I need. Check to see if the design shows clearly on the wrong side of the fabric. This is the case with many fabrics and it is helpful because we prefer to iron FP templates on the WRONG side of the fabric, so we can mark the seam lines. Working on the wrong side saves an extra step when we want to mark lines on the fabric. In this example, I need 4 POTC hexagons, so I have 4 window templates. That’s another advantage over acrylic shapes. I can have as many as I want on the fabric at the same time! 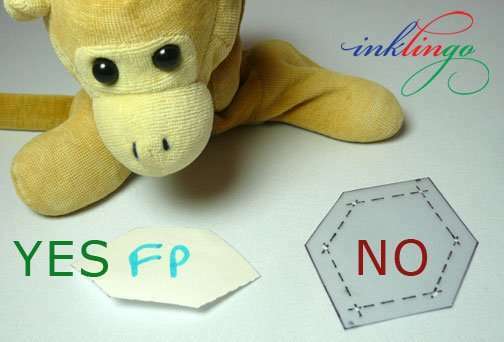 I have some cool template tips to share in a future article, like marking “FP” on the paper side, so you don’t mistakenly touch the plastic side of the template with a hot iron. Still on the ironing surface, place the FP shape WITHOUT seam allowances into the window opening and press it into position. Each identical design is now marked with two pieces of FP, the window and the center. 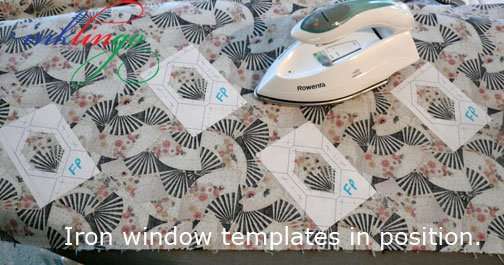 Still at the ironing surface, peel off the window template leaving the template without seam allowances in position. Check the points/corners to make sure they are all identical. Re-press if necessary. This template won’t move while I cut! Love it! Slide a cutting mat underneath and cut around the FP, adding the seam allowances. I have a few cool tips to share in a future article for rotary cutting and scissors cutting, so please stay tuned! 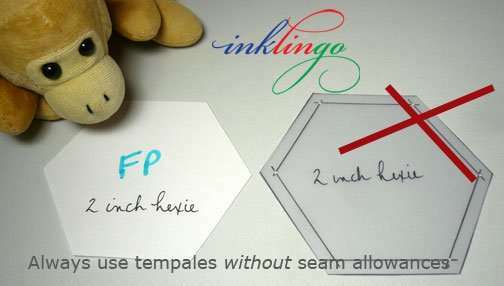 Still on the cutting mat, use a mechanical pencil and a thin, flexible ruler to mark the stitching lines, crosshairs and matching marks to imitate the results you get when you print the shapes on fabric with Inklingo (below)–fine, accurate lines. 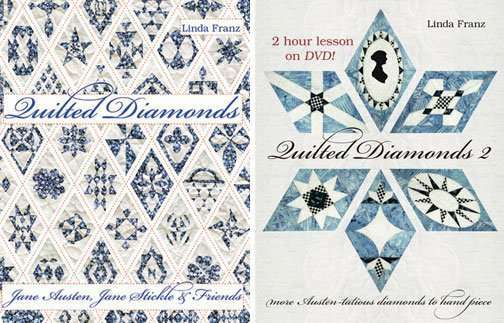 This is the method I teach in my Quilted Diamonds books (pre-Inklingo). 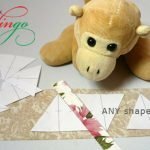 Those books are an excellent introduction to hand piecing but the template technique applies to machine piecing too. 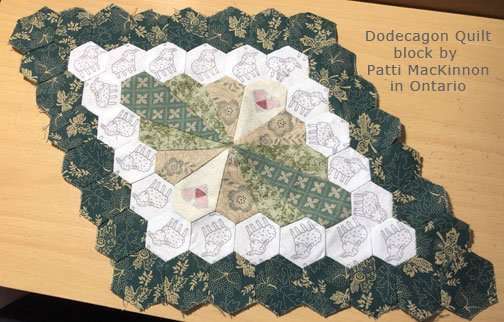 In this example for hexagons for Patchwork of the Crosses, I want sewing lines but sometimes the lines are not necessary. 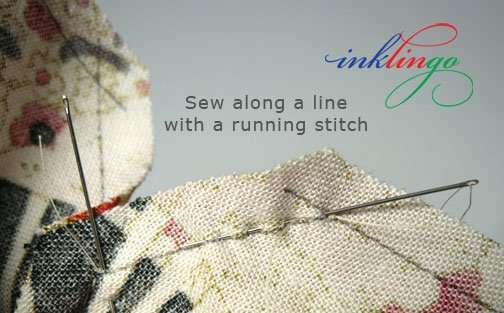 For example, if you are machine piecing and there are no inset seams, you do not have to mark any lines on the fabric. If you need to mark the sewing lines the way I do for POTC and you have to work on the front to choose the designs, it takes a little more time. 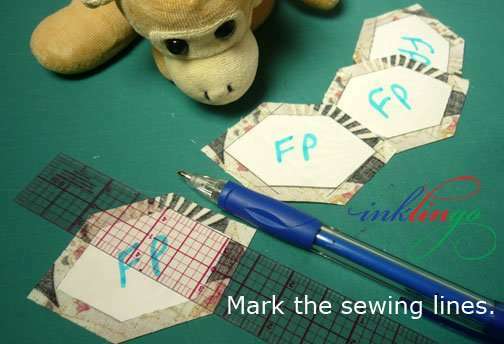 After cutting the shapes, remove the template from the front of the fabric and go back to the ironing surface to press it on the wrong side of the fabric (centered), so you can mark the sewing lines. It is an extra step but totally worth it for the right fabric! Marking the seam lines is a huge advantage over acrylic, where the best you can do is mark dots through holes and then sew “Dot to Dot.” I’m an experienced piecer but D to D is doomed to disappoint! Quilt shops like selling stuff—templates, sheets of plastic, punches, special markers, etc. but when you learn about freezer paper, you won’t need those things. Spend money on fabric and skip the stuff you don’t need—especially anything that adds extra work. You will be a better customer if you finish your quilt faster and buy fabric for the next one sooner. 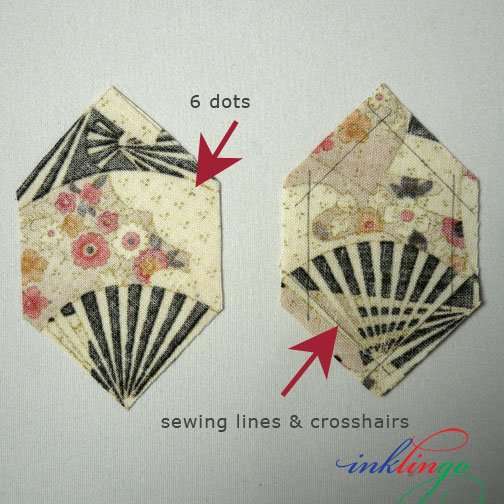 Imagine how well this works for designs like Passacaglia, where you sometimes need TEN identical shapes for fussy cutting. You can have enough FP templates for each one, not just one or two acrylic shapes to slide around. 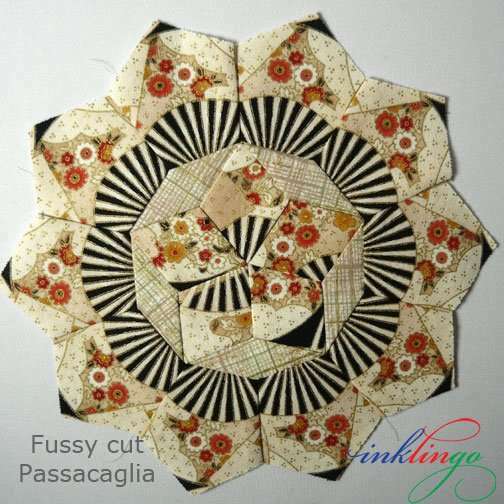 I cut several Passacaglia photos from this looooong article but I have more to show you about fussy cutting the shapes for it in another article. I think now you can see why I use FP templates WITHOUT seam allowances for fussy cutting—NOT shapes with seam allowances. They can be ironed securely into position for greater accuracy. I can have as many as I want. I can have any shape, any size. I can choose a wider or narrower seam allowance. They make it easy to mark the sewing lines, if I need them. Once you know how to use freezer paper, you will never need to buy acrylic/plastic/metal shapes again—whether you use Inklingo or not. By the way, I do not have any affiliation with freezer paper companies and I don’t sell it myself. It is just a fabulous product. I love using it and I recommend to everyone. Freezer paper is less expensive and does more than any other template material. 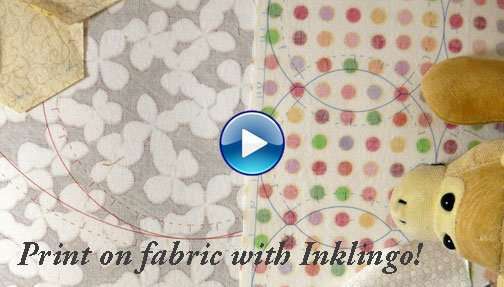 This VIDEO on the Welcome to Inklingo page on the website explains how printing on fabric with Inklingo works with your ordinary Inkjet printer. This article got soooo long that I cut out several good tips for using freezer paper. I will share them in other articles. If you subscribe to the blog (top of right side-bar) you won’t miss anything. Please subscribe to the blog and follow the Inklingo Facebook page for more. Before you go, review the list under Template Rule # 1—and then tell your friends about freezer paper. I put that info at the top because it is so important. 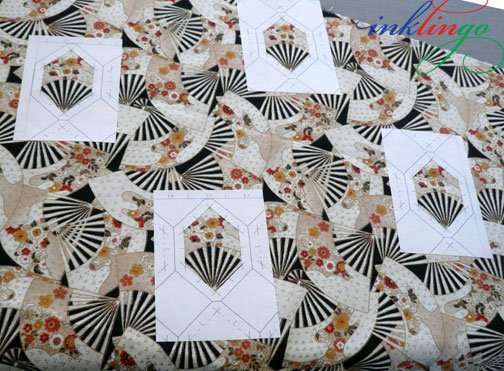 I hope you will also tell your friends about the new Inklingo mystery quilt, The Case of the Diamond Necklace (COTDN). New clue coming soon! Hi Glenda, I’m glad you were watching the live video! There are examples of window templates in the POTC book too. 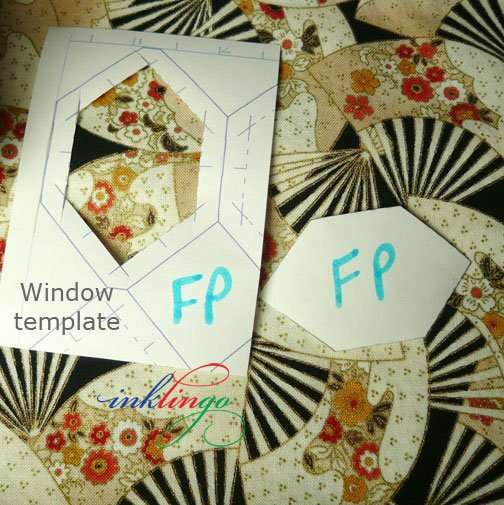 Window templates made with Inklingo have many uses, from choosing suitable fabrics in a quilt shop to cutting the shapes and marking the lines. I think you will love using them. Thanks Linda. I totally understand now from your explanation why it is a difficult ask. I will persevere with my computer and keep annoying hubby who without his computer knowledge I would be totally lost. Thanks again. I am sorry but Inklingo PDFs will not work on phones or iPads/tablets–yet. Maybe some day. I keep working on it. Inklingo uses printing features which work best on computers (PC or Mac). Even though it is possible to print from some tablets (with great difficulty! ), they only provide a very limited print dialog box, so it is not possible to print Custom Page Sizes even when the printer has that feature. A small screen is also a drawback. I am concerned that a quilter might buy Inklingo for a tablet and then be frustrated when it came time to print—the key feature. Luckily, so far, most quilters have a computer. ALL Inklingo layouts are bigger than A4 and that is a GOOD thing. That is one of the 3 key concepts that makes Inklingo so wonderful. Hi Linda, I enjoyed every word you wrote long or not! However, I wish the programme was able to be used with an IPad as for me it would be so much simpler and faster, as I am not that great with the computer. We have an old computer and pages sometimes seem to skip when I don’t want them to, so I get frustrated with it. A while back I purchased “Cleopatras Fan” but I think the size may be too big to print on A4 Australian computer paper size, so having a bit of trouble getting started. Will give it another go. Have been busy with other quilting hence the reason for my delay. Too many fingers in too many pies. My mind is all over the place with excitement for quilt making. Have to try sticking to one quilt at a time. (HARD)! But love Inklingo concept can’t wait to get stuck into it! Now I am too long! Sorry! Thank you for the excellent post for fussy cutting without acrylic templates. No problem with long, I don’t want to miss any details! Thanks again! It gives me a good feeling to know you like this long one! Thank you, Chris. I love your tutorials. I wish I made more use of them. (I am getting there) Your instructions are fabulous, I love the incredible fabrics you choose. 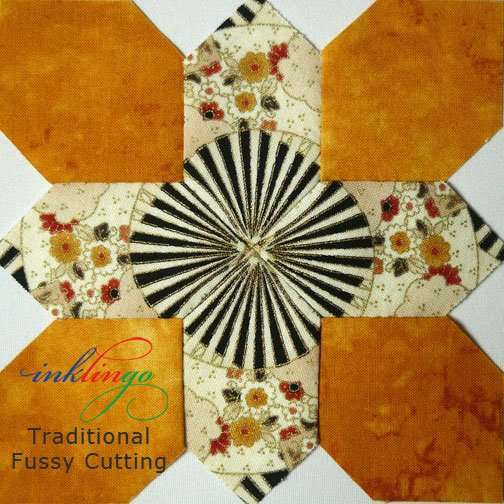 You have made hand piecing and fussy cutting painless. Well almost painless. Arthritis still aches! lol. TY so much for all your work. What a lovely comment, Judy! Thank you. It makes me happy to think you enjoy my tutorials. Russ sometimes tells me they are too long but I want to share it all. 🙂 I hope you can manage your arthritis and keep on sewing! PS I’m going to make sure Russ sees your comment too. Thank you, Driveway Barb! I love that you are sharing your enthusiasm for Inklingo with everyone in Texas. Please say hi from me & Monkey too. Ha! I didn’t even feel like the blog post was long as I was totally engrossed in your fabulous instructions, Linda! And the cute pics of Monkey, of course. 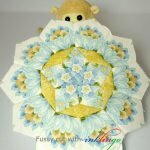 I’m sharing this with some of my favorite quilt buds…. Sally and I were just sharing yesterday about no waste fussy cutting with our small stitch group and the other two gals want to do some 6 pointed stars! They are just too fun to make! New Inklingo converts on the way! Yahoo! He helps me proofread before I post on the blog and when he saw this one yesterday he was shocked by the length. I lopped and cropped as much as I could. I am delighted that you like it–and I have dozens of photos and several paragraphs “in the bank” for a few more articles. I hope you have a great weekend with time to print and sew. Another great article, Linda!! Long is GOOD! Love using freezer paper templates for everything; but especially for fussy cutting and always with Inklingo!! Today I learned to press the “inside” of the cutout template back onto the fabric, peel off the outside and then draw the cutting lines with the ruler!! Fantastic!! You certainly think of everything to make our lives easier!! Thank you!!!! Thank you very much, Valerie! It is encouraging to know that you read it all. Your comment gave me a very good feeling. Thank you, Annika! I’m glad you like that photo AND read all the way to the end. I think I took about 250 photos this week. Some are better than others. Monkey loves the attention. I love the detailed articles and don’t mind if they’re long. They are very interesting and l love to learn. 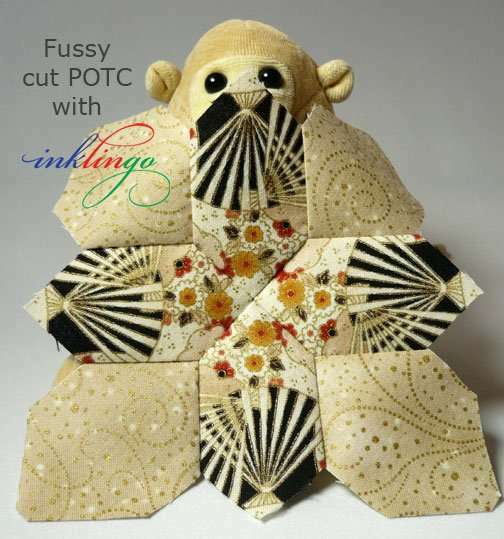 René and I both had to laugh about the picture of Monkey peeking from behind a gorgeous fussy cut quilt block. Your Pickled Ladies are sensational. 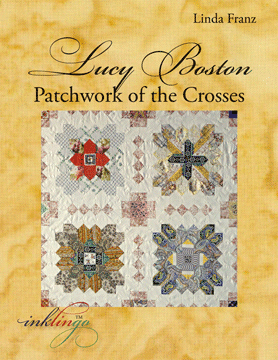 I am thrilled that you have shared the photos on the Quilt Obsession blog. It is going to be a masterpiece! I have many photos and paragraphs left over. I am very pleased that this one not too long for you. The window templates I made in just a few minutes with the clamshell pickle collection really made the whole idea I had for the Pickled Ladies quilt oh, so achievable! !I haven’t tried the other type of Swiss-cheese fussy cutting, using a freezer paper template, but if I ever do I’ll definitely be using Inklingo to print the templates on freezer paper as I know that they’ll be completely accurate! I love your ‘long’ articles! They are so interesting and packed with great techniques!